The all-new 2014 Subaru XV Crosstrek Hybrid is about to launch and it's getting a new ECU from Tata Elxsi, a Tata group company. You may not have heard the name Tata Elxsi, but they will be developing the ECU for Subaru's first new hybrid vehicle, the 2014 XV Crosstrek Hybrid. The Tata Group company has also produced some recognizable digital TV ads. Their automotive electronics division has been awarded this complex electronic product development contract by Fuji Heavy Industries (FHI) the maker of Subaru automobiles. The company has plenty of experience with AUTOSAR compliant electronics development and the Indian company has just completed development of an Autosar 3.0 compliant gateway ECU (Electronic Control Unit) for the new 2014 XV Crosstrek Hybrid. Tata Elxsi started producing the ECU for the XV Crosstrek Hybrid in June as it gets ready for Subaru to launch the first hybrid this fall. This complex ECU is developed on a dual-core microcontroller, which helps control the inter-bus communication necessary to pass information between multiple communication networks within the new hybrid. The new XV Crosstrek Hybrid ECU included complete hardware & software development, hardware-software integration and system level testing. Anil Sondur, Vice-President, Tata Elxsi, said: "This is a moment of great pride to see our technical and engineering capability being utilized and deployed in the market by Subaru." The Subaru XV Crosstrek Hybrid combines the already efficient 2.0-liter Subaru Boxer engine with a 13.4-hp electric motor that’s integrated into the Lineartronic Continuously Variable Transmission (CVT). A 100v, 13.5kw nickel-metal hydride battery is located under a revised rear floor area, and the engine uses and integrated starter/generator for the automatic start/stop feature. The compact hybrid system weighs just 209 lbs. and places the electric motor just behind the transmission and in front of continuously variable transfer clutch. With the addition of all the new features, the new hybrid weighs approximately 300 lbs. more than the gas variant XV Crosstrek. The Subaru-engineered hybrid system uses the electric motor for initial vehicle acceleration and then starts the gasoline engine once underway. The electric motor can also provide motor assist for acceleration in parallel with the gasoline engine, and an EV mode will operate the vehicle in certain low-speed situations. Brake regeneration works when the car is coasting or the driver has applied the brake, recapturing kinetic energy from the turning wheels to recharge the battery. 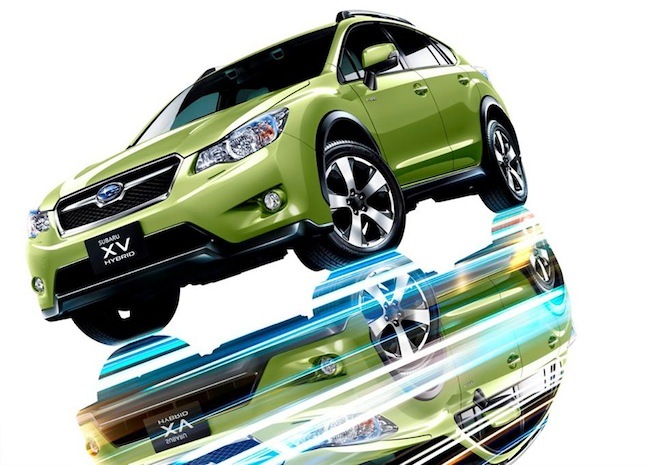 Look for the all-new 2014 Subaru XV Crosstrek hybrid to be in showrooms later this fall. Stay tuned to Torque News for the upcoming launch of Subaru’s first hybrid model.